Maya Angelou, born Marguerite Ann Johnson on April 4, 1928, in St. Louis, Missouri, was raised in St. Louis and Stamps, Arkansas. 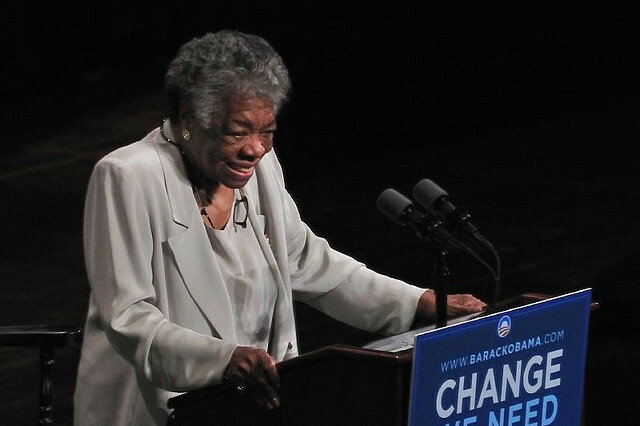 She is the daughter of Bailey Johnson and Vivian Baxter Johnson, and has a brother whom called her “Maya,” derived from his nickname for her, “my-a-sister.” While growing up in Stamps, Angelou faced the brunt of racial discrimination, but her traditional African-American family, community and cultural values allowed her to persevere. Angelou grew passionate for the arts as a teenager, and she gained a scholarship to study dance and drama at San Francisco’s Labor School. She subsequently dropped out of Labor School, at age 14, to become San Francisco’s first African-American female cable car conductor. Later, she finished high school, giving birth to her son, Guy, a few weeks after the graduation. She supported her son as a single mother by working as a waitress and cook, until her passion for music, dance, performance and poetry took prominence in her life.